enables you to add a new profile and ´Delete´ that will delete the currently selected profile. If you have only 1 profile you can not delete that. Each profile can use a different output format. If you choose Output format “New project” this profile will use the general output format as set before in the ‘New project” page. Look at the ‘New project’ setup for explanation about the different available formats. The name of your radio server and port-number. In the common form: ´servername:portnr´ for instance ´radio789.com:5004´. If you do not fill in the :portnr LUCI will use the default port, which is 5004. If you use LUCI Studio only as a server do not fill in the ip-address. But fill in :5004 for instance(including the colon). It will still send a stream back when it receives a valid stream. For ipv6 you should put the address between square brackets like this: [2001:980:4937:1:1483:291:1351:a206] . You can of course also use a URL with ipv6. Fill in the user-name you use to login at your server. For the RTP protocol this is not used. Fill in the password belonging to your user name. This password can also be used in a simple RTP authentication. 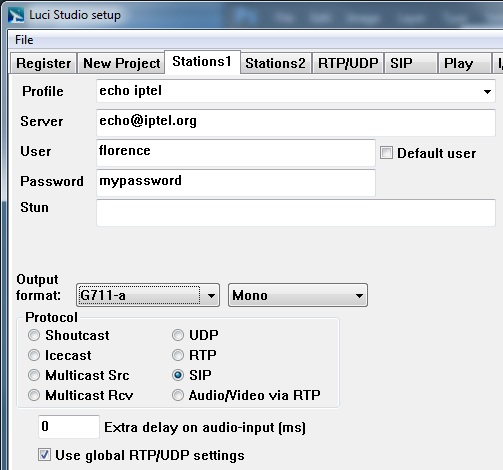 LUCI Studio’s use of the UDP and RTP protocol is explained extensively in the server installation guide. We advice to use RTP on port 5010. For this protocol you can use the following conventions for the different fields. user Is the one who you want to call. URL:port Is the sip server and port to logon or REGISTER to. user Is the one who you want to call. The default sip server settings from the SIP page are used. If you want LUCI Studio to only wait for a call and manual pick-up. Pick up a call by pressing the MIC-button. “echo@iptel.org” means you call user echo at iptel.org on sip-port 5060 (5060 is the default when no port has been specified). Btw, this address actually works, but only with G711 codecs. User and Password are YOUR credentials when you want to logon or REGISTER to a sip-server. When you do NOT specify a user, LUCI will not try to REGISTER to the sip-server. Tick Default user when you want to use the sip server settings from the SIP page. explanation of the settings, see the Options page. Multicast Src: extra delay before transmitting. 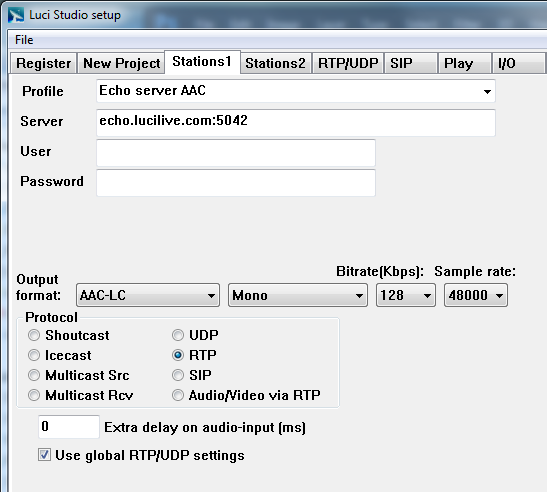 Multicast Rcv: extra delay at local audio output. All other protocols: extra delay before transmitting. You can have different RTP/UDP settings per station or you can use the global RTP/UDP settings set with the RTP/UDP page. For an explanation of the settings, see the RTP/UDP page. The mount-name, for Icecast servers. The name of your radio-station. You can test your server-settings with this button. LUCI Studio will try to contact your server.